The restaurant premises are constructed in an L shape with a bar area in the back portion. It is not very large and seats, I would estimate, about 60 people if filled to capacity. It is a little cluttered and rather grubby inside, although not horribly so, and, while I would have liked to take a picture of the roasted ducks hanging in the kitchen window, the glass was far too grimy to allow that. 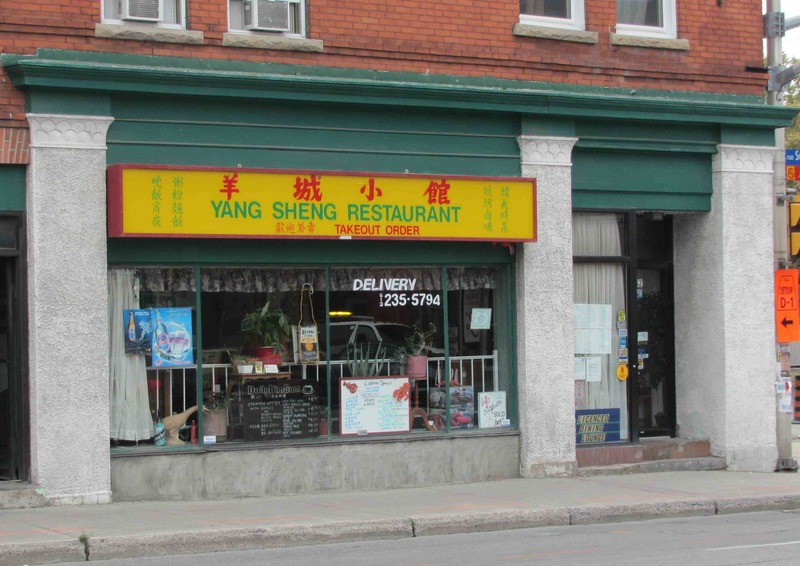 I arrived at Yang Sheng around noon but they didn’t seem to have much of a lunch rush as only a half dozen of their tables were occupied during the whole of my visit. 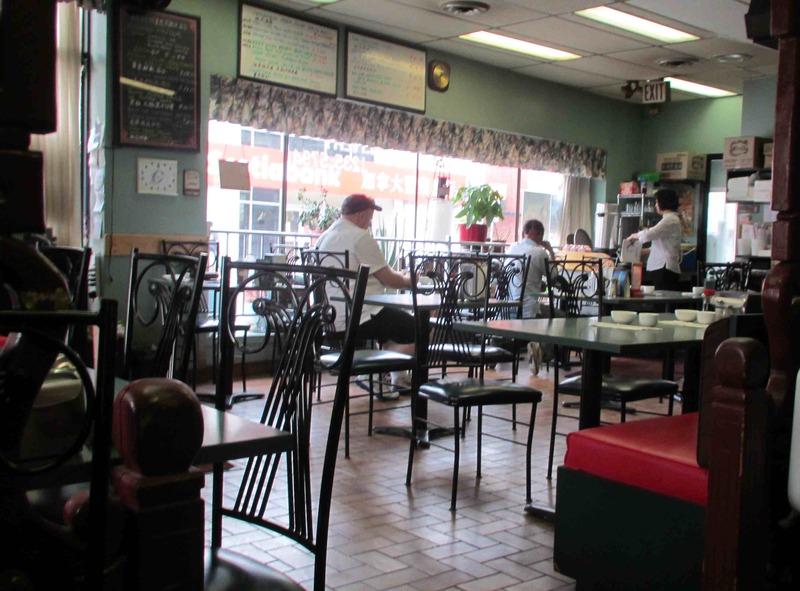 The service was prompt and immediately upon being seated I was given a pot of very nice tea. The waitress was quite friendly but her English was a little limited and there were a couple of confusions as a result. There were some questions I would have liked to ask about the food but, unfortunately, just ordering dishes was enough of a linguistic stretch so as to preclude much else. 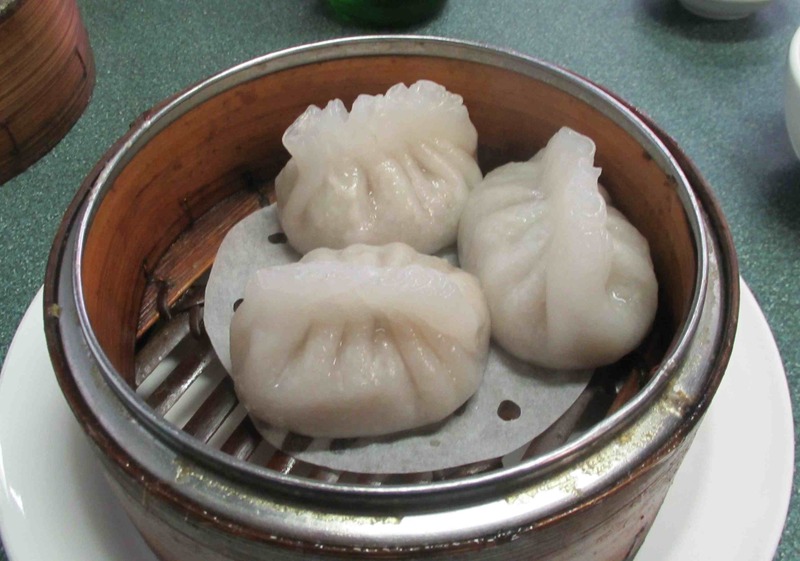 These were identified on the table menu as鮮肉水餃 (xiān ròu shuǐjiǎo), which is a boiled pork dumpling, but they were misidentified on the specials board as being of the steamed variety. They arrived as an order of six and came with a Sriracha type sauce and red vinegar along with a little bowl to mix them. 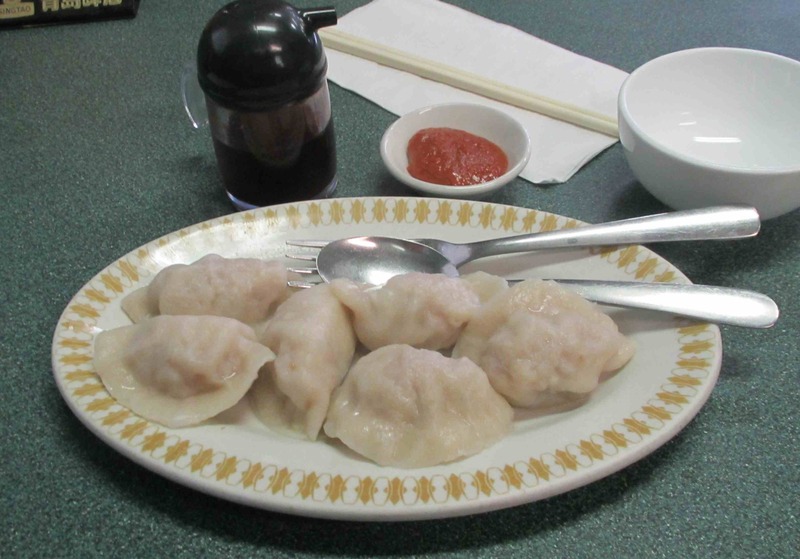 Although a little crudely formed, the dumplings were very succulently juicy and tasty. The pork was quite finely ground, while maintaining a pleasant texture and was lightly seasoned with just a little white pepper and scallions. I thought they rated a good 3 out of 5. I often order the common 蝦餃 as a test of a restaurant’s dumpling making ability and I have to say that this offering was not especially impressive. The four that I was served were nicely formed but they were carelessly placed in the steamer (a poor indicator of skill) and were stuck together. The dough was nicely translucent but it was way too thick and chewy and the filling less than optimum. Some places use just a thick shrimp paste as a filling while others mix the paste with larger chunks of shrimp. This version, however seemed to be substantial chunks of shrimp without much paste at all and though, while actually pretty tasty, the overall effect with the substandard wrapper was disappointing. I rated these at a bare 2 out of 5. These were basically the relatively common dim sum item known as 粉餜 and, being the 潮洲 (chiu chow) variety, were noted on the menu (as an allergy warning) to contain peanuts. The wrapper, though prettily if unorthodoxly formed, was way too thick, but the filling was not all that bad. In addition to the peanuts, there was ground pork, black mushroom, carrot, and, just possibly, some diced daikon, all of which was in a sauce reminiscent of hoisin. These might not have been too bad, all in all, but the size of them made them very unwieldy and they easily fell apart under their own weight when lifted. I liked the taste but the poor execution meant they only rated a 2 out of 5 for me. Again, these looked quite pretty with nicely translucent dough, but the result was less than the promise. 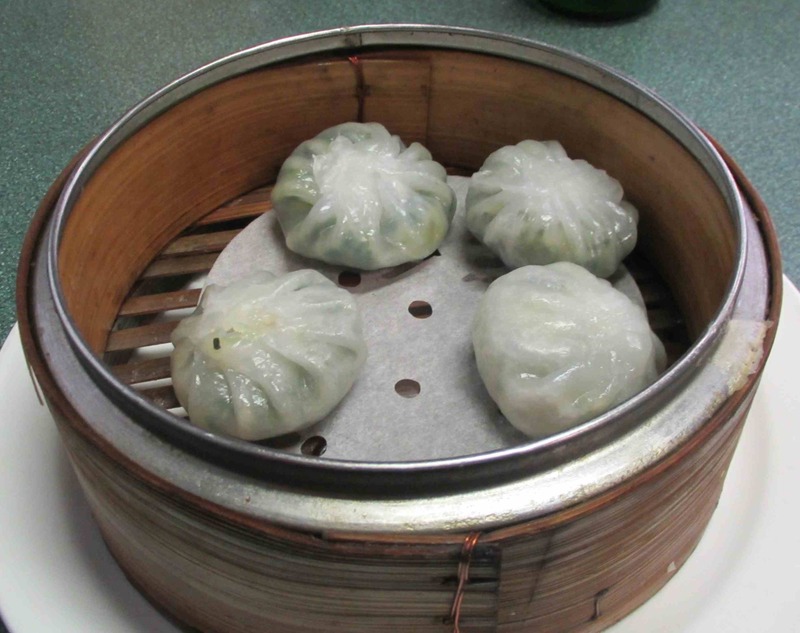 The dumplings were not steamed long enough, leaving the wrapper chewy and tough and the filling, though ostensibly shrimp and chive, tasted like fish and spinach. They were okay dipped in soy and vinegar but largely a disappointment worth only a rating of 1 out of 5. You actually tried a lot of dumplings! I looked at the menu and was amazed by how many different types of dishes there were. I think you should try more of the stir fried dishes next time, maybe then you can examine the qualify of the food better. Quite a mune! Nowhere here in VA do we have a chinatown, although there are areas where Asian stores and restaurants seem to profligate. I miss living in the various cities I have lived where there are Chinatowns. Did you ever get the Iren Kuo book? I’d be interested to hear what you think and if you have tried anything from it. Sorry to hear the the dumplings were sub-par. 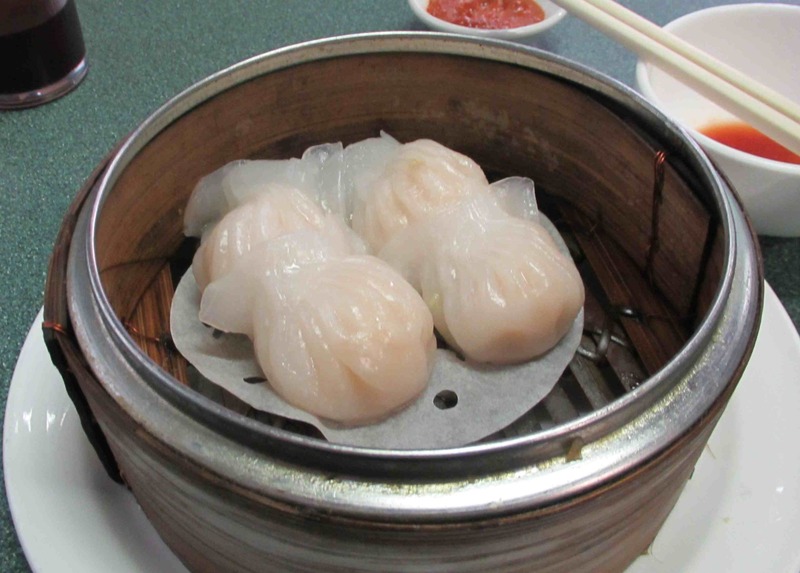 Har Gow is my absolute favorite and it always makes me sad to get mediocre ones! Do they have the restaurant health canafa inspection ratings in the window in Ottawa too? Grubby would not bode well for me. I didn’t check, to be honest. Grubbiness is relative… I wasn’t overly put off but some other reviewers gave really bad marks for cleanliness. Oh how I love Har Gow ! Yumm!